Hamburg - was once again one of Hamburger SV's most prominent performers in the first leg of their relegation play-off clash with Greuther Fürth. Not only did the playmaker get in four shots on goal in the 0-0 draw, the Turkish international also won 22 tackles – more than anybody else on the field. Disappointment was written all over his face come the final whistle, yet Calhanoglu has not given up hope ahead of the second leg. "It's our last chance, it's as simple as that," he said in an interview. "That's why we've got to give it everything we've got for one last 90 minutes. The 20-year-old also spoke about Hamburg's poor away form, the support from the fans and the style of play Hamburg could employ in Fürth. 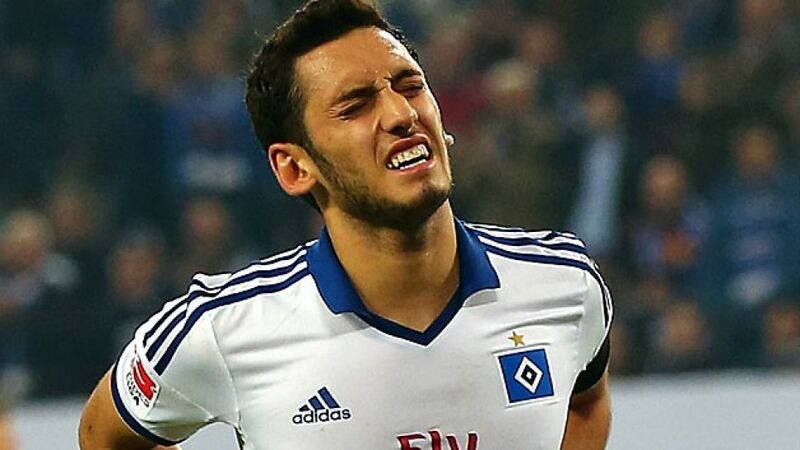 Question: Hakan Calhanoglu, can you be happy with this goalless draw? Calhanoglu: The priority was not conceding and we've done that, but unfortunately we didn't score a goal ourselves. We tried a lot in the first half and put them under pressure, but in the end we've only got a 0-0 unfortunately. We've just got to live with that. Calhanoglu: Yes, that was truly unbelievable - absolutely amazing. They urged us on for the whole 90 minutes and I'm just sorry we weren't able to give them something back. Question: What do you now have to change in Fürth? Calhanoglu: We don't really have to make all that many changes, we just have to try to latch onto this performance when we get to Fürth. Maybe we'll also get that break we need there and be able to take our chances. Question: But your poor record away from home is hardly a source of hope, is it? Calhanoglu: Maybe all that will be different against a second-division side. I think we'll play a lot better away from home against them than we have been doing lately in the Bundesliga. Question: What gives you hope that HSV will remain in the Bundesliga next season? Calhanoglu: It's our last chance, it's as simple as that. That's why we've got to give it everything we've got for one last 90 minutes.